The information in this post covers the 1950s to the 1990s. During these years, Florsheim dominated the dress shoe market in the United States. The company produced some great (and not so great), shoes during that period. These vintage Florsheim shoes are sought after by men’s dress shoe enthusiasts and are commonly bought and sold on eBay. I have never worked for Florsheim but I have bought and sold hundreds of pairs vintage Florsheim shoes. So the information I am providing in this post has largely been gathered from first hand experience, old Florsheim catalogs and some research done by a number of awesome Japanese shoe bloggers. If you buy or sell vintage Florsheim shoes, you should find this information useful. I hope! Looking for info on Shell Cordovan models? Visit this post which has a complete list of Florsheim’s vintage Shell Cordovan models. And read my guide to buying a Florsheim Imperial 93605. I have a post on buying vintage shoes which explains to what to look for when buying a pair. So let’s start by looking at all the numbers and letters you typically find in a vintage Florsheim. These will be on the inner right side of the shoe. Florsheim used two letters on the shoes to represent the year and month (see discussion). The first character is the month (A=January, B=February, and so on). The second character is the last digit of the year (A=0, B=1, etc). In the 1950s, the month was a letter but the year was a number (i.e. “D9”). So in the example above, GH would be July of the year 7. Is that 1997 or 1987 or 1977 or 1967? I am guessing it is 1977. This was a model produced in the 1960s and 1970s and this particular shoe has a post-1973 v-cleat (more on that later). Unfortunately for us, Florsheim decided to use a single character to represent the year. So its difficult to date Florsheim shoes to the year without knowing the years the model was produced. And that information is hard to come by. More on that later. From 1957 to 2002, the model number was a 5 digit code. The first reference I saw for this 5 digit number system was in a February 1957 ad, but it may have started in late 1956. Prior to those years, the models usually started with “S-” or “F-” and were followed by 4 digits. So if you find a shoe with that pattern of model number, you know it is 60+ years old. Nice find. What about number 1? I haven’t seen any models starting with 1. Modern Florsheim shoe model numbers (2002+), usually start with a 1 though. Maybe that’s why they chose it. What about the shoe last? Allen Edmonds encodes the last into the model number, did Florsheim? I don’t believe so. I have found no mention of lasts in any Florsheim ads/materials. This numbering schema was fairly consistent until the early 1990s. There was probably some guy on the product team making sure the model numbers conformed to this system. In the 90s, older model numbers started getting reused, Royal Imperials became Imperials. Model number anarchy! Why? I assume it was because that “guy” was probably laid off. Where was this shoe made? There is no “Made in…” label on the inside. If the shoe doesn’t have a country of origin, the shoe was most likely made in the USA. Made in India shoes will say “Made in India”. Florsheim also made shoes in Canada, Italy, Brazil, China, Australia, and Spain. So if you are listing a Florsheim shoe on eBay to sell, enter “United States” as the country of manufacture when listing a shoe without a “Made in …” label. Canadian Florsheim shoes have a maple leaf on the insole. Very occasionally you might see names and non-standard model number numbers in Florsheim shoes. These are made to order (MTO) models and are unique in some ways. I once purchased a split toe Imperial model with the model code of “3F-2397X” and the seller told me it was a special order from the Chicago Florsheim store. I didn’t actually send a model number in my email so the customer service response made no sense but I got their point. I assumed they won’t help with my pre-1952 shoes as well. The message content is a non sequitur and ironic since Florsheim puts “Established 1892”, not “2002”, in their logo. But feel free to email Florsheim customer service and maybe you will get a positive response. If not, I am happy to help with vintage Florsheim questions, you can email me via the contact form or leave a comment below. Any shoe care products purchases made after clicking on the Amazon ads help defer some of the monthly hosting costs. I own a pair of shoes with markings like those shown in the last photo where the model number is marked 97625 but the shoes are labeled simply “Florsheim Imperials” as you noted in the photo caption. From what I’ve learned on this site, that particular model number would have previously been associated with a Royal Imperial shoe. Do you have any idea at what point in time Florsheim dropped the Royal Imperial line from their offerings? Strange that they would keep the model number. Perhaps the lasts used were the Royal Imperial lasts, but with no more of the Royal Imperial branding? Of the 97625 models I have seen, and I have seen a lot, 1996 was the first year I saw Florsheim drop the “Royal” prefix for the 97625. Build wise, it looks like the same shoe to me but with a different liner color. The heel is slightly different. I believe Florsheim eliminated the shoe bags when it became an Imperial. Great source of information. I just picked up a great pair of 96032 BG loafers made in Italy and everything here matched up perfectly. The only thing that appears different is that the insole has THE ROYAL IMPERIAL in gold letters and an image of a royal scepter. I’d love to know when that logo was used. I figure they are either 1966 or 1976. Probably 1976. I believe that is a 70s model. Thanks for your interesting article here. I have a mystery that I have not been able to solve after reading all above. I have a split toe, five eyelet shoe with a heel stamped: The Florsheim Shoe. The interior numbers are as follows: 9C 651202 1392, with the following markings on the leather insole: K union made 2 (with a circle around the 2). I can send photos. Please help! That pair was likely made in the late 1940s or early 1950s. Rare shoes. You can send your email address via the contact form. I just picked up a pair of 93605. The only stamped information is the size and model number. There is no sequence number, factory code, date code, or country of manufacture stamped on either shoe. The footbed logo is the older style (although very worn and unclear). The heels and sole have been replaced so no clues there. Any idea when these shoes may have been made? And why no date stamp? I have a brown pebble grain split toe that has the model 7S3379 BH on the inside. Any idea when these might have been made? They are labeled Florsheim Imperials with the pre 90s sole label. I have a similar pair. I believe they were likely made in the 1970s. I just found a pair of split toe, 5 eyelet Imperials in brown. They have two cleats inset flush with the heel (same as the black ones in your other article). The code next to the size is “312489” and the code below is OF 3396 LA. The text is in black and pretty clear. I have searched everywhere for some information on this model but can’t find anything. Do you have any ideas? Thanks and love your site! Sorry, the Name field on the form wasn’t visible on my phone. My name is John. Great informative site you have! I have a pair with the number 30813 HB. The insole has a round logo (too worn to make much out other than Florsheim Shoe(?) and Reg. U.S. Pat. Off. Any idea of a year/decade/style? Thanks. I just purchased a pair of Florsheim v-cleat wingtips the model number is 634605. Any information would be appreciated. The model number is 5 digits, not 6. Check the inside of the shoe again. The other numbers are too faded to read. I found a pair with model number 0109. Could you help with any information? You’ll need to send me a photo or two. david at vcleat dot com. I have a pair of Florsheims with the model number 75291. Any idea of the model or where I could get info about them? The 75291 is a black apron toe blucher. I believe it was made in the 1980s. Its a lower end model. I recently purchased a pair of Royal Imperial model 96614 with a date code of KD. They have a split leather/rubber heel. Do you have any information on the type of leather, years produced, etc.? Thanks in advance! That model was made in the early to mid-1970s. The leather was likely what Florsheim called “Coventry Calf”. Not 100% on that. I have read a few people saying it was Bison or Buffalo. They could be right. Or wrong. Wow, what a great article and fount of refreshing knowledge you are! I have a pair of Florsheim Imperial loafers that I think are deerskin, I’d call them bit loafers, except the bit is a leather twist, like a beefroll. The code inside is 18332. They are like these http://ebay.to/2ncw1ct but tan leather with no canvas. Can you help me, Obi Wan? Sorry but I don’t have any info on that model. Since the model number starts with 1, they were likely made after 2002. You might email Florsheim customer service for model info. Do you know the locations of all 14 Florsheim factories that operated in the 1970’s? Were any located in TN? No I don’t. I spent a day once trying to align the manufacturing code in the shoe with the plant. No luck. The internet failed me. Again. I have a curious shoe. It appears to be a black shell cordovan Imperial shoe with the Theater like logo inside and says “made in USA. However, the model number seems to be missing. The information found on the inside of the shoe is 7 1/2 — D– 355175–2. Below that where the model number should be there is nothing except HG– made in the USA. Additionally it has a vcleat that is flush with the outside of the heal. I can send photos once I figure out how to do so… or send them to you directly. Thoughts? That’s probably a mid-90s model. Florsheim produced black shell cordovan long wings in the 90s but they must have been special runs or MTO. Thus no model number. You can send me a photo at david at vcleat dot com. I bought a pair of vintage Florsheim Oxford-Spectators and have no idea what year they are from. Could you tell me based on the numbers inside? I looked and have no information on the 31325 model but its likely from 67 or 77. If you send me some photos at david at vcleat dot com, i will take a look at them. Great info! I just found a pair that are marked 773606 and have a name instead of a size. Does this mean they were custom made for someone? Any idea what year they are from? Thank you! If the shoes have a name then they made to order. Is there a date code in the shoe? If so, that helps with dating them. Hi, i bought a pair of vintage imperial quality with code 7 3E 1059 03 09 under these numbers is another numbers & letters code 7392 DI. Any idea what year is this? Thank you. Send me a photo. My contact info is listed above or on the contact page. I found a pair of brown shoes in great shape, stored in a bag with shoe trees for likely over 40 years. The model number is S1356 followed by COMB. Where can I find out about these? I have an old 1951 Florsheim catalog and found the pair. The model is called “The Stroller”. So the pair was likely made in the later 40s or early 50s. Thanks for your quick reply. This is very helpful. The shoes really don’t show any sign of wear creases in the leather at all, and are not scuffed. The leather is in great shape. The soles have only very light wear. The laces need to be replaced, but I could easily wear them now. I found a pair of Florsheim Idlers Boots in a thrift store yesterday. Numbers are 11 B 760790 19 and 70022 GH. Any info would be great! I found your article quite helpful. Thank you for all the research you have done. The number is 97318 AJ. Sounds like that is a Royal Imperial Brown Balmoral from January ending in a 9. There is no v-cleat that I can see and no “made in” marking. Best guess of the age? Thanks. Those shoes were probably made in 1989. I own a pair of Florsheim longwings marked 436I4 DG (The “I” is the letter, not the number “one”). These are single sole, partially lined spectators with white scotch grain combined with smooth, dark brown leather. Based on the code DG, I’m guessing these are made in 1966. Or was Florsheim still making spectators in 1976? Thanks for all the interesting info! I have a pic, but unsure how to attach it here! Sorry. I don’t have any information on that model. Could you please tell me the factory correct edge color for the Florsheim Imperial hand stained brown calf skin also the Golden Harvest? Hello, Although the printed name is visible the style numbers or size are not visible at all. I wonder if these are custom made shoes. I need some help determining what model and age that these Florseheim’s are. These Black Shell Cordovan Florsheim Imperial Derby’s have 5 eyelets, Full Goodyear Welt, V-Plate Heel. The nails have been removed on the heel and partly covered with heel savers. The v-cleat position is inset within the heel top lift. The plate does show on back bottom of the heel. Have hand peg shank, calf skin lining. 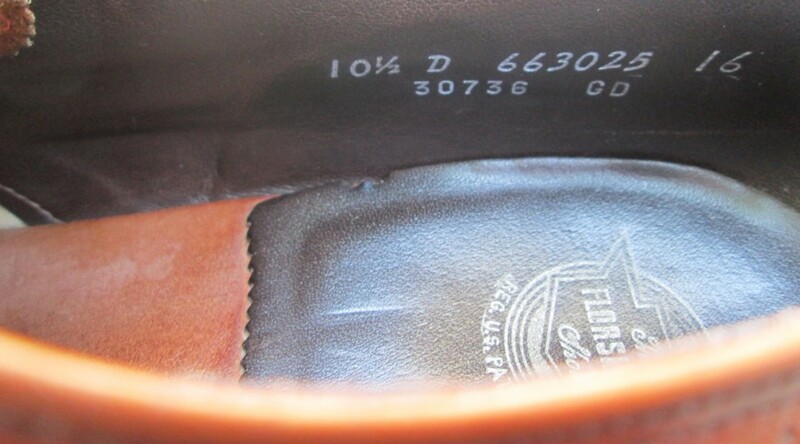 Insole reads “The Florsheim Shoe” “Imperial Quality” on the insole.. On the upper inside of one shoe there is an oval design inset that reads “Florsheim Imperial”. They are in Very nice condition. Please send instructions to send a photo. I would greatly appreciate any information you can give me. I have a pair of 92604 KI and a similar pair of light brown 8F339200 JI. Any clue as to the significance of the numbers in the latter pair? Re-reading your Golden Harvest and burgundy shell oxford posts, it seems the pair in question are a pair of special run Golden Harvests. Will send pics when I can. Thanks again. 96092 LF, Any help would be greatly appreciated. Sorry. I don’t have any info on that model. I have a pair of Footage in shoes. Model number 21103 JI. I found them in one of your other post in the catalogs so they were made in Oct 67-69. Are they worth selling? 93602 CJ what’s the info on these numbers? Hi, I have a pair of Florsheim shoes. The info is below. I saw this model number in your article saying it was produced in the 60s and 70s. With it being a less common model, I’ve had trouble finding the value of these shoes. If there is any info you can provide, I would appreciate your help so much! I can send pictures if you’d like. Feel free to email me at traci.m.warren@gmail.com and I’ll also bookmark this page to keep an eye out for your reply. Great model but not highly sought after. It’s the same model as the main photo of this post. Its worth $50 to $80 depending on condition. Hello David, Any idea on how Florsheim did the wood grain pattern on their soles? Love having access to all of your information. I do have a question about a pair of Florsheim’s I recently acquired. The number in the shoe is 97622. Wanted to know if you had ever found any information on that shoe. Looks like they will make a great addition to the rest of my vintage Florsheim’s. Date code puts them at a 1998 vintage. Any info you would have would be great. There is a pair on ebay, too narrow unfortunately, that have a green on gold inset Royal Imperial by Florsheim. Wondering when that was used. Hi David, I came into a pair of Florsheim Royal Imperials with a serial of 96308 DC, which puts the manufacture at April 19×2. Insole has “The Royal Imperial Florsheim Shoe” scepter logo; both that logo and the serial number are stamped in gold lettering. I’m thinking they’re most likely 1982 vintage, judging by some of the info I was able to get from your site, but I would like to nail down the year for sure if possible. Any thoughts? Thanks! Yes, you are right. That model was made in the early 1980s. It was not made in the 1990s. any ideal when these were produced please? thanks.